Finance Minister Arun Jaitley also said that the demonetisation would help India to embrace digital economy. NEW DELHI: The Prime Minister of India Narendra Modi on Tuesday, termed the demonetisation as the beginning of government efforts to curb black money. Finance Minister Arun Jaitley also said that the demonetisation would help India to embrace digital economy. Speaking at Parliamentary Board meeting of the BJP, the Prime Minister noted that more than Rs 5 lakh crore has already come into the banking system. "Demonetisation is the only beginning of government effort to cleanse the system of black money and corruption. In the coming times more steps will be taken against black money," said Modi. The meeting attended by the BJP MPs of both the Houses came at a time when Parliament stands paralysed over the issue of demonetization. 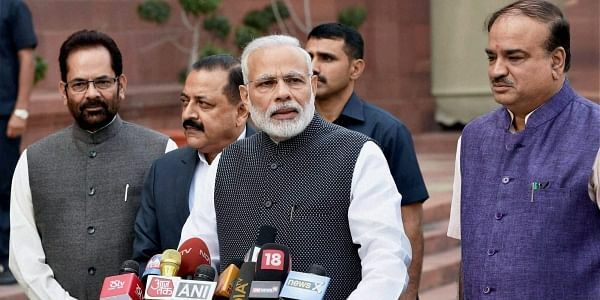 Apparently seeking to rally support for the decision on demonetization, the top brass of the NDA government sought to send a strong message that the move would give huge tangible benefits to the people at large. "Demonetisation will help us achieve an honest economy and help improve the lots of the poor," said Modi. The BJP Parliamentary board has welcomed the decision of the government on banning of old Rs 500 and Rs 1000 currency notes in a resolution passed unanimously in the meeting. "The decision on demonetization will help people to adopt a digital mode of payments. This will bring the cash component in the economy substantially," said Jaitley, while speaking at the meeting. The resolution passed at the meeting also claimed that the decision on demonetization has destroyed the terror funding network, besides the counterfeit currencies.